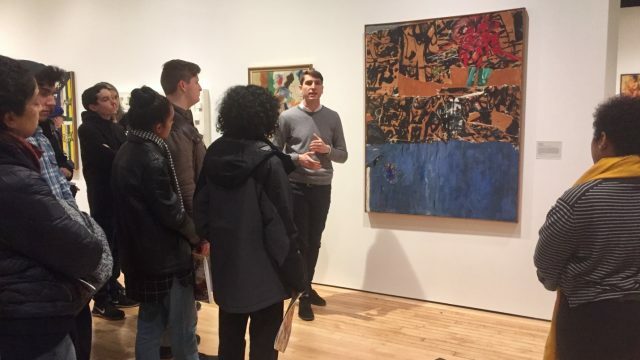 Brian Bentley discussing Allan Kaprow’s Blue Blue Blue (1956) in Inventing Downtown with Donna Cameron’s class “Politics of Portraiture” (Tisch School of the Arts, NYU), January 21, 2017. Recently, we spoke with the Grey Art Gallery’s Graduate Curatorial Assistant Brian Bentley to catch a glimpse of his work at the Grey. In this interview, Brian not only generously shared his curatorial experience but also gave us some tips on how to survive a PhD program. Having recently passed the crucial PhD oral exam, Brian is now a PhD candidate at NYU’s Institute of Fine Arts (IFA). We are sincerely awed by his achievements and grateful to him for providing a list of enjoyable and valuable books, exhibition catalogues, and essays for you to read. This interview was conducted by Yuxi Pan, a Graduate Intern at the Grey Art Gallery, an MA Candidate in Visual Arts Administration at NYU, and a freelance art writer who contributes to influential Chinese arts and culture publications. I’d like to start with your experience working at the Grey. Could you share with us your main duties here? I often work on lots of different things at once, mostly having to do with current and upcoming exhibitions. With A Feast of Astonishments: Charlotte Moorman and the Avant-Garde, 1960s–1980s, I was able to give tours, which has been one of the highlights of my time so far at the Grey and a real learning process to be able to engage with many different groups, especially NYU students. In the fall I wrote the labels for Inventing Downtown: Artist-Run Galleries in New York City, 1952–1965 with the invaluable help of Lucy Oakley [Dr. Oakley is the Grey’s Head of Education and Programs] and had a busy schedule of giving talks during the exhibition’s run. Those were the other main tasks I worked on and highlights of my time here. In addition, I’ve done a lot of research on, and drafted press releases and funding proposals for, the Grey’s upcoming shows, especially Mark Mothersbaugh: Myopia, which is scheduled to open on April 26. You’ve mentioned you are working on a lot of different tasks here. So what is your favorite part? My favorite part has been giving tours, something I have found really challenging and rewarding, especially with the need to adapt each tour for its audience. It is very different to give a tour, for example, to younger students who may not be aware of or interested in certain movements in art history that relate to the exhibition, versus advanced conservation students who know a great deal of technical information about the works under discussion. It is fascinating to hear the different perspectives of artists and long-time residents from NYU’s neighborhood, who have a lot to offer regarding Inventing Downtown. For me, this exhibition exemplifies how a show can be both rigorous and scholarly as well as accessible to a wider audience, which I find imperative to the success of any exhibition and museum. You are now a curatorial assistant at the Grey. Is your career goal to be a curator? How did you enter the curatorial field? Yes, my main goal is to become a curator. I hope to do that upon obtaining my PhD, which should happen only a few years from now. When I was an undergraduate art history honors student at McGill University, I had the opportunity to graduate after only three and a half years, which left me with an extra semester at the end of my time in Montreal to do a few internships. One of them was with an exhibition space focused on photography, video, and film called Dazibao. It was a very small operation, but I was able to get experience researching many contemporary artists and to become involved with the curatorial office on a basic level. That was my first real experience in the curatorial field, though I interned at the Albany Institute of History and Art in high school to get a sense of what the museum world could be. I went directly from my undergraduate studies into a master’s program at the IFA. After graduation, I was hired as a Curatorial Assistant in the Arts of the Americas and Europe Department at the Brooklyn Museum, where I worked with three separate collections for three excellent curators. This job not only allowed me to use my research interests and experience in Latin American art — which had primarily been focused on modern and contemporary—but also pushed me to go out of my comfort zone, when I went further back in time to study Brooklyn’s Spanish Colonial and European holdings under the mentorship of Rich Aste, as well as Native American and Pre-Columbian art. What is the difference between working at the Grey and working at other larger institutions, such as the Brooklyn Museum? Every institution has its own style. The real strength of the Grey Art Gallery, which sparked my interest in working here, is its position as a university art museum. For example, it gives great opportunities to NYU students to be part of the behind-the-scenes work. The Grey’s small staff size requires flexibility, since each staff member wears many different hats and engages in all stages of exhibition organization. Larger art institutions have many departments and things can get sent off to different areas, each with a distinct focus on a certain aspect of the exhibition, which may make curatorial work feel less cohesive in comparison with someplace like the Grey. To put it frankly, the best thing about working at a small institution such as the Grey is the opportunity to get involved with more aspects of the start-to-finish process of an exhibition. Tell us something about your current PhD studies at the IFA. How did you end up there? What advice would you give to a current student who has an interest in pursuing an advanced degree in art history? I became aware of Professor Edward J. Sullivan’s writings when I was an undergraduate, and his scholarship directly encouraged me to enroll at the IFA. In his innovative program in Latin American Art and with his endless support, I have continued on that path. So an important piece of advice I would like to give students is to find an advisor who can help navigate the sometimes confusing balance of occupation and research. Since I moved to New York in 2011, he has helped me in every major step I took, whether it was to find a position at the Brooklyn Museum, the Grey, or to go back to the IFA and pursue a PhD. Also, it is important to stay focused on what most interests you but also to be flexible in terms of whatever comes along. It is easy to become overly specific about your area of expertise within academia, so remaining as open as possible in the early stages of graduate school is hugely important. I remember IFA Professor Alexander Nagel making a comment about the IFA “bubble.” This might be seen as a pejorative thing, but what he pointed out is that it is beneficial to use the resources that are right around you as much as possible, not to take access to resources for granted. I think trying to get as much as possible out of each and every faculty member in a given program is a worthwhile means of expanding your interests and forging connections. Only when I enrolled in coursework on Pre-Columbian art or Professor Nagel’s Medieval Modern seminar did I realize how informative such areas of study can be to my field of Latin American contemporary art. Monica Amor, Theories of the Nonobject: Argentina, Brazil, Venezuela, 1944–1969. Berkeley: University of California Press, 2016. Patrick Frank, Painting in a State of Exception: New Figuration in Argentina, 1960–1965. Gainesville: University Press of Florida, 2016. Abigail McEwen, Revolutionary Horizons: Art and Polemics in 1950s Cuba. New Haven: Yale University Press, 2016. Elena Shtromberg, Art Systems: Brazil and the 1970s. Austin: University of Texas Press, 2016. William Kaizen, Against Immediacy: Video Art and Media Populism. Lebanon: Dartmouth College Press, 2016. Hito Steyerl, The Wretched of the Screen. New York: Sternberg Press, 2012. Anne Ellegood and Johanna Burton, Take It or Leave It: Institution, Image, Ideology. Exh. cat. New York and Los Angeles: Prestel in association with Hammer Museum, 2014. Cynthia Carr, Fire in the Belly: The Life and Times of David Wojnarowicz. New York: Bloomsbury USA, 2013. Helen Molesworth, This Will Have Been: Art, Love, and Politics in the 1980s. Exh. cat. New Haven: Yale University Press, 2012.